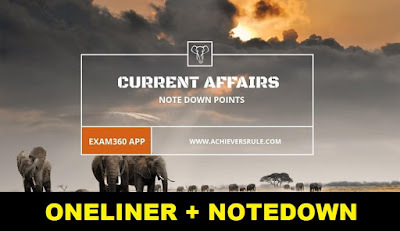 Current Affairs & Gk Note-Down point of 17 July 2018 we cover all important National,International,Financial,Sports news which are relevant for upcoming SBI PO,SBI Clerk,SSC,IBPS RRB exams.We at Achieversrule regularly provide One Liner Current Affairs and Gk Note Down points to keep our candidates prepared for Current Affairs section of Banking,Insurance exams.The Static GK Note Down points which are provided, linked with Current Affairs Update and candidates are requested to study these points regularly because these points are frequently asked in different exams as static questions. Haryana Chief Minister Manohar Lal Khattar launched the 'Paudhagiri' campaign, aimed at increasing the green cover in the state.Under this campaign students from class 6 to 12 of all government and private schools in Haryana will plant a sapling each during three months monsoon- July,August and September. President Ram Nath Kovind has approved the Assam Witch Hunting (Prohibition, Prevention and Protection) Bill, 2015, converting it to an Act, almost three years after it was passed by the state Assembly. The Union Minister of Commerce & Industry and Civil Aviation, Suresh Prabhu, today co-chaired 8th session of India-Oman Joint Commission Meeting (JCM) along with Minister of Industry, Investment, Trade and Digital Economy of Oman, Dr. Ali bin Masoud Al Sunaidy. The International Monetary Fund (IMF) on Monday projected a growth rate of 7.3% in 2018 and 7.5% in 2019 for India as against 6.7% in 2017, making it the fastest growing country among major economies. The board of Life Insurance Corporation of India approved a proposal to buy up to 51 percent stake in IDBI Bank Ltd.
India's wholesale inflation grew 5.77 percent in June, marking a four-and-half year high.the latest price data released by the commerce and industry ministry shows the Wholesale Price Index (WPI) witnessing a growth of 4.43 percent in May and 0.90 percent in June 2017. Haryana Governor Kaptan Singh Solanki was given the additional charge of Himachal Pradesh, as the incumbent Acharya Devvrat is visiting the US. An eight-year-old Indian-origin schoolboy who is the under-11 UK national yoga champion has been named the 'British Indian of the Year' in the young achiever category for his accomplishments in the field.Ishwar Sharma has won a string of titles in both individual and artistic yoga, most recently a gold medal representing Great Britain at the World Student Games 2018 in Winnipeg, Canada, in June. JK Rowling's next book Lethal White to release under her pseudonym Robert Galbraith on 18th September. Marc Marquez clinched an incredible ninth German Grand Prix victory across all classes to strengthen his claim as the ‘Sachsen-King’ with a dominant display at what is likely to be the final MotoGP race at the Sachsenring, taking a major step towards a fourth consecutive world championship. Vinesh Phogat added another gold medal to her rich haul after claiming the top position at the Spain Grand Prix in Women's 50 Kg free style category.in Madrid . Veteran actor Rita Bhaduri, best known for her roles in films like Hero No 1 and Beta, has died. She was 62. Noted Kannada film lyricist and poet MN Vyasa Rao passed away at the age of 73 at his residence in Bengaluru. Chief minister of Haryana : Manohar Lal Khattar. Capital of Oman : Muscat. Currency of Oman: Omani Rial. Union Minister of Commerce & Industry and Civil Aviation:Suresh Prabhu. Secretary of the Department of economic affairs : Subhas Chandra Garg. Chief minister of Assam : Saraband Sonwal. Capital of Assam : Dispur. Soft power 30 Index : It is published by UK based strategic communications consultancy firm Portland and The University of South California Centre on Public Diplomacy. Capital of Spain : Madrid.